(Press Unit in the Office of the Prime Minister) – The twin-island Federation of St. Kitts and Nevis has much to gain as a nation by holding onto the word of God. That view was expressed by Prime Minister Dr. the Honourable Timothy Harris when he addressed the regular and visiting congregation of the Calvary Baptist Church in Sandy Point on Sunday, 5th November, 2017. St. Kitts and Nevis’ Prime Minister regularly worships at the various churches of different denominations across the Federation. Sunday’s service at the Calvary Baptist Church was led by Assistant Pastor Collin Mulley, and also saw a special presentation from guest speaker, Bishop Ron Collins. Following his highly spirited and motivational sermon, Bishop Collins anointed Prime Minister Harris in front of the entire congregation and prayed for God’s grace and divine will to guide the Prime Minister as he carries out his duties and responsibilities as leader of the twin-island Federation. 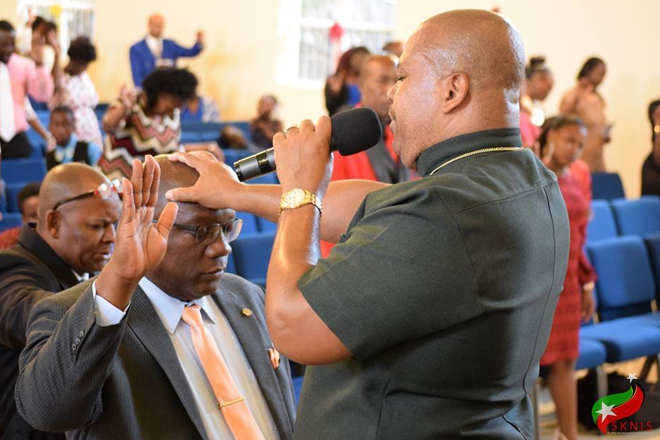 Recognizing the importance of God and the church to nation-building, the Team Unity administration created a Ministry of Ecclesiastical Affairs, which is headed by Senior Minister and Premier of Nevis, the Honourable Vance Amory. Bishop Ron Collins is the Ministry’s acting Permanent Secretary. Through that ministry, the Dr. the Honourable Timothy Harris-led Government has sought to ensure the faith-based community has a voice in all facets of national development, particularly as it relates to addressing the issue of crime and violence. Prime Minister Harris and his Cabinet has met with church leaders several times, including in August of this year. In August, representatives of the St. Kitts Christian Council, the St. Kitts Evangelical Association and the Nevis Evangelical Association met with Prime Minister Harris, the National Security Advisor, Major General Stewart Saunders, and other high-level officials of the national security apparatus at Government Headquarters.